Legal news for product liability attorneys – The CPSC and NJ-based LaJobi announced a nationwide recall of Graco drop side cribs, which poses entrapment and fall risks. Crib’s drop side hardware may break or fail, allowing drop side to detach from crib. Washington, DC (www.NewYorkInjuryNews.com) – On Thursday, April 29, 2010, the U.S. Consumer Product Safety Commission, (CPSC) http://cpsc.gov, announced it is performing a voluntary recall, in cooperation with LaJobi Inc., of Cranberry, NJ, of Graco-branded drop side cribs. Consumers are prompted to discontinue use of the items, unless otherwise instructed. The drop side hardware of the crib can break or fail, which then allows the drop side to detach from the crib. If the drop side detaches, a hazardous gap is created between the drop side and the crib mattress. Infants and toddlers in the crib can become entrapped between the crib and mattress, posing a risk of suffocation and strangulation. Furthermore, children can fall from the cribs due to the opening created on the drop side. The CPSC and the manufacturer LaJobi have received 99 reports of drop side issues, including hardware breakage and drop side detachment. Two children became entrapped in the gap between the wall and mattress, and six children fell out of the crib. One child suffered a mild concussion. 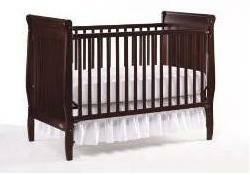 The cribs were full size cribs and sold in cherry, espresso, natural and white finishes. Printed on a label affixed to the footboard or headboard of the crib are the item’s production date, item number, purchase order number and finish name. The manufacturer’s name, “LaJobi” along with the crib model name are printed on a product sticker on the stabilizer bar or bottom rail of the crib. The cribs were manufactured in Vietnam and China and were sold at children’s product stores and other retailers nationwide from February 2007 to March 2010. They retailed between $140 and $200. Consumers are told to contact LaJobi for any additional information at (888) 842-2215 any time, or by visiting the firm’s website www.LaJobi.com.